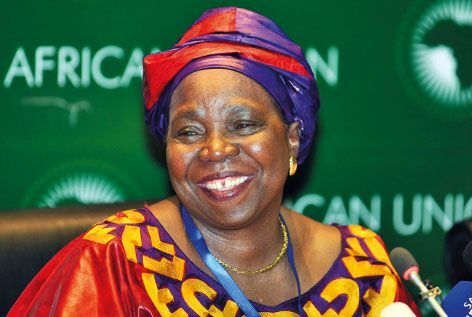 A weekend summit ended in the wee hours today, and from it emerged the 1st woman leader of the African Union. She is Dr. Nkosazana Dlamini-Zuma (right), a physician and longtime public official in South Africa. Dlamini-Zuma narrowly won in her contest against the incumbent Chair of the African Union Commission. That would be Gabon's Jean Ping, an outspoken opponent of the International Criminal Court. The election marked the 2d go-round for these candidates: as we then posted, in January neither garnered the necessary 2/3 vote. As late as this weekend, continued impasse seemed likely, with voting seemingly divided between the English- and French-speaking portions of Africa. The report of "'a definite sense of relief'" after Sunday's vote thus come as no surprise. The summit, indeed, began with talk of the ICC, the permanent court launched at Rome 14 years ago today. It too has new leadership, including Prosecutor Fatou Bensouda of Gambia, sworn in just 4 weeks ago. In a separate report, a representative of a Kenya-based NGO was quoted very differently; he called the plan "a sideshow that will not succeed." No post-summit reports indicate that the idea came to a vote at Addis Ababa, in any event. Will the advent of a new AU leader and a new ICC Prosecutor jumpstart a new relationship between the two institutions?